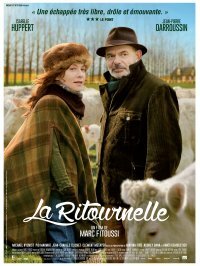 After the success of Copacabana in 2010, director Mark Fitoussi rejoins Isabelle Huppert in La Ritournelle, a charming, easy-going tale of love among the haystacks – or in this case cattle-breeders – set in northern France. It explores the well-worn theme, and the backbone of many a French movie, of infidelity. And it touches on a topic increasingly in evidence in French films of late – older women escaping the daily grind to take a voyage of self-discovery. With Catherine Deneuve in Elle s’en va, Karen Viard in Lulu Femme Nue and Emmanuelle Devos in Arret ou Je Continue these films are rapidly becoming a genre of their own. Huppert is Brigitte, the wife of cattle-breeder Xavier (Jean-Pierre Darroussin). They have been married for an eternity and live a comfortable, if unexciting life, on the farm tending the animals and entering agricultural shows. While Xavier seems content and happily spends the evening reading his cattle-breeding magazines, Brigitte is gradually losing her identity and seeks adventure and diversity. On the pretext of going to Paris for a medical appointment, she books into a hotel, goes shopping, does a little sight seeing before bumping into good-looking businessman Jesper (Michael Nyqvist) who is staying in the same hotel. They have a brief affair before Brtgitte returns home to her husband, unaware that Xavier had followed her to Paris and seen her with another man. While on the face of it, La Ritournelle offers nothing new, Fitoussi’s lightness of touch and the excellent casting of Huppert and Darroussin in the lead roles have produced a simply-told, moving, elegant story. Infideltiy for this couple in their late 50s is not the death blow to their relationship, but highlights the necessity to re-examine the basis of their marriage. And while their love for each other is never called into question, La Ritournelle asks is this enough? On paper, casting Huppert as a cattle breeder’s wife is a risky move, but she is faultless as the intelligent, slightly-dazed, fragile Brigitte who seems as surprised as anyone by her sudden need to break free. Darroussin hits the spot as the misanthropic Xavier who is forced to confront the possibility of losing his wife to another man. Alongside the story of Brigitte and Xavier, Fitoussi says he also wanted to update the image of the agricultural community in France which is seen as outdated and depressing. Although there are shades of Flaubert’s Madame Bovary in Brigitte’s situation, Fitoussi shows an occupation where farmers watch over their stock on a webcam and live in material comfort with well-satisfied lives. La Ritournelle is definitely an all-round success for Fitoussi, Huppert, Darroussin et al.